The Kubota Combination Lock provides security to lock your bike, toolbox, storage unit or shed. Features a hardened metal shackle for cut resistance and durable locking mechanism with numeric combination. It keeps your valuables safe and secure. The Master Lock No. 4697D Set Your Own Combination TSA-Accepted Luggage Lock features a 1-3/8 inch. (36mm) wide metal body for durability. The 1/8 inch. (3mm) diameter shackle is 1-1/2 inch. (38mm) long and made of vinyl covered flexible braided steel, offering resistance to abuse from baggage handling equipment. Transportation Security Administration (TSA) screeners can open, inspect and relock bags locked with a TSA-Accepted lock. Lock your checked baggage with the lock TSA screeners won't cut! The Master Lock No. 4696T Set Your Own Combination TSA-Accepted Luggage Lock features a 1-5/16 inch. (35mm) wide metal body for durability. The 1/4 inch. (6mm) diameter shackle is 1-7/8 inch. (48mm) long, offers extended reach for use on equipment cases and is made of steel, offering resistance to cutting and sawing. Transportation Security Administration (TSA) screeners can open, inspect and relock bags and cases locked with a TSA-Accepted lock. Lock your checked baggage with the lock TSA screeners won't cut! The Limited Lifetime Warranty provides peace of mind from a brand you can trust. Master Lock is synonymous with Innovation and seriously Tough security. Magnum padlocks feature, a patented Octagonal "Boron-Carbide" Shackle, Dual-Armor construction for superior rust protection, Professional- grade ball bearing locking for superior pull strength and pry resistance, Chisel resistant and recessed rivets. Magnum padlocks are twice as tough. 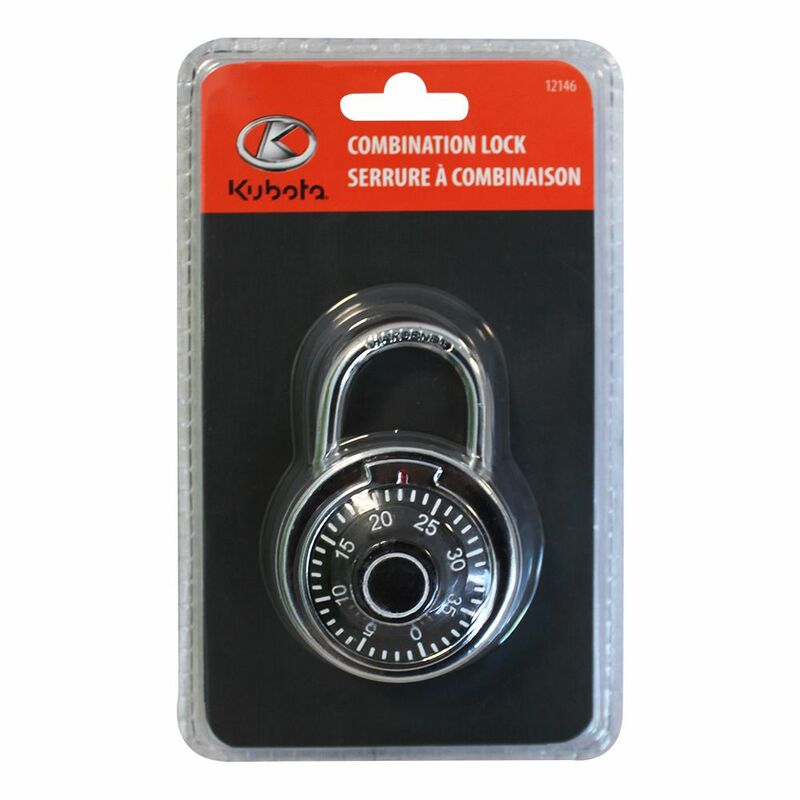 Combination Lock The Kubota Combination Lock provides security to lock your bike, toolbox, storage unit or shed. Features a hardened metal shackle for cut resistance and durable locking mechanism with numeric combination. It keeps your valuables safe and secure.